Its status as best in its field is undisputed, but has it got better? Photoshop is one of the few applications that stands alone in its market. There may be other ways to edit images – photographers have Adobe's own Lightroom and Apple's Aperture – but nothing matches Photoshop's breadth and depth of features. You could be forgiven for thinking there wasn't much more to add, except that Photoshop users are rarely lost for a shortcoming to bemoan. This latest version will satisfy some of their cravings, while still leaving itches unscratched. As with the other CS4 apps, the Application Frame and tabbed windows are disorienting at first, but on closer inspection the toolbox and panels are pretty familiar. While looking different from CS3, the panel docks behave in much the same way, which is not entirely a good thing. Sometimes you can resize a panel, sometimes you can't, and getting the ones you want to coexist neatly can be a constant niggle. Still, once you've got acclimatised and tried the various tiling options, you'll begin to appreciate the benefits. You can revert to floating windows if you prefer, but it does seem like a better way of working. However, some aspects feel awkward. In Firefox you switch tabs using [Ctrl]+[Tab ], but here you have to use the C+[ ] window switching shortcut, which confusingly ignores what order the tabs are in. You can rearrange tiled images by dragging their divider bars, which is great, but certain layouts are currently impossible, such as one image across the top and two below. Annoyingly, you can't preset an arrangement and then load images into it; dividers only exist when they're occupied. At last, you can zoom in and out at will, with your artwork staying smooth. This is hardly a new concept, but Photoshop users have traditionally put up with some jaggies at intermediate zoom factors. Thanks to Adobe's adoption of OpenGL graphics acceleration (supported by most modern Macs), you can hold O and scroll the mouse wheel to zoom freely. Even with the Zoom tool and View shortcuts, you get a smooth transition rather than a jump. It all feels very responsive, and is topped off by the Rotate View tool, with which you can turn the whole canvas to any angle. This could be helpful when drawing freehand, though it's a shame you have to finish your stroke before you can rotate. When you're using a brush – whether to paint colour, clone an area or apply an adjustment – you can now resize it interactively by holding O+[Ctrl] and dragging, and alter its hardness using C.
In CS3, the Clone and Healing tools gained an Overlay option: a ghost image of the layer you were cloning from would follow your cursor, so you'd know what you were going to be painting with. A Clipped option now sensibly restricts the ghost to within your brush tip, although, at the risk of being picky, we'd have preferred it just a bit bigger. The Dodge and Burn tools, which paint areas lighter or darker, gain a Protect Tones tick box, making changes look more natural, while the Sponge can use the new Vibrance adjustment, borrowed from Lightroom, to make less noise-prone saturation tweaks. Retouchers will be pleased. New commands are few and far between, but the most interesting is Content Aware Scaling, also known as seam carving. Normally, if you need to make an image fit a taller or wider space, you have to crop it; scaling it disproportionately would make people and objects look long and thin or short and fat. CAS tries to preserve these salient features while scaling everything else. This is a brilliant idea, but after browsing hundreds of images we failed to find a single one it really worked on. However, rather than letting CAS do all the work, you can manually select areas you want to leave unmolested and add these to an alpha channel, which you then choose via the Protect button. This worked well. Some of the most exciting new tools are reserved for Photoshop Extended, controversially introduced in CS3 to separate 3D, motion graphics and scientific users from the hoi polloi. This edition costs around £300 more (£150 for the upgrade), which is steep, but the new 3D capabilities, again exploiting OpenGL, may be enough to swing it. You can create simple 3D objects by wrapping artwork around preset shapes. Even better, you can import ready-made objects in formats such as 3D Studio. It's amazing to be able to load a complex model into a Photoshop layer, control its lighting and textures, rotate it in space, then incorporate it into your artwork using masks, Adjustment Layers and so on. Within the standard edition, potentially the most significant feature is the Adjustments panel. This lets you use Adjustment Layers without all the dialog boxes, and could change the way everyday image correction is done by making this non-destructive method more accessible. Unfortunately, the panel itself is poorly designed, with a jumble of 15 icons for the various adjustments. When you click one, the panel switches to show its sliders, leaving you to click a funny grey arrow to get back to the list view. You still have to use the Layers panel to see which adjustment you're working on. The accompanying Masks panel lets you feather a layer mask, alter its density (the degree to which it applies) and refine its edge. The fact that you can quickly adjust vector as well as pixel masks here should help to make vector masking more popular. Again, though, the awkward, modal design of the new panel compromises its effectiveness. Photographers will welcome the upgraded Camera Raw 5, invoked via Photoshop or Bridge to pre-process shots from serious digital cameras. The interface still feels a bit unfinished, but there are some great new features inherited from Lightroom 2. A full range of adjustments can be brushed on, and there's a gradient filter to add shading and vignettes. New Camera Profiles can boost images with Adobe's enhanced colour rendering or match the appearance you'd get with the camera's own software. There are good additions in this release, including some, inevitably, that we haven't had room to mention. But it doesn't feel such a big step forward as CS3. 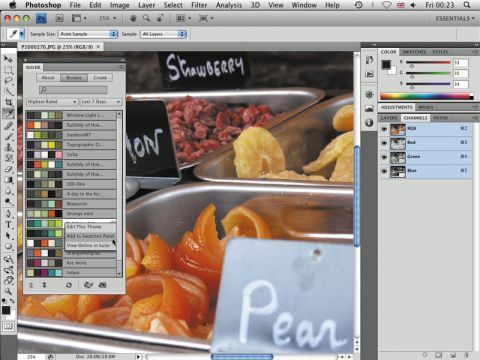 As an application, Photoshop is still the proud leader in a field of one; as an upgrade, it'll leave many users comparing the price tag with the feature list.